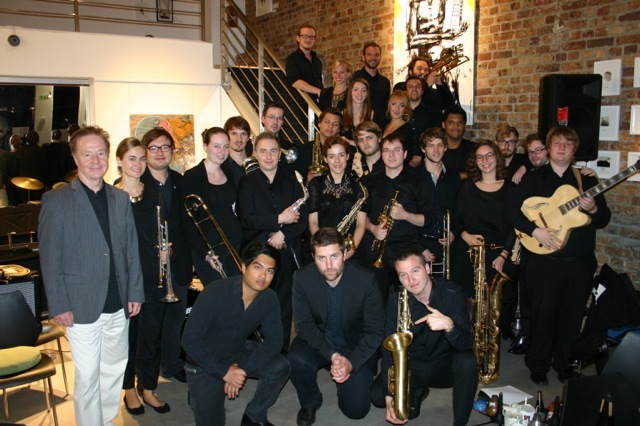 The Hessen State Youth Jazz Orchestra, also known as “Kicks & Sticks“, was founded in 1985 by Wolfgang Diefenbach with the goal of enabling talented young musicians to receive professional big-band training at the highest level. Numerous young jazz musicians in the German state of Hessen had been waiting for such a chance and applied to join the newly-founded band. The project was ultimately made possible by the former Hessen Minister of Finance, who put the necessary funding at the band’s disposal. The concept is based on three main pillars: workshop sessions with well-known jazz celebrities as tutors; outstanding stage appearances; and professional (studio) recordings. The orchestra plays in the traditional big-band formation, with a wind section consisting of five trumpets, four trombones and five saxophones, and a rhythm group with four or five musicians. In addition to mainstream standard titles from Duke Ellington and Count Basie, the ensemble mainly studies titles which have been composed or arranged exclusively for the orchestra. After the first workshop session the band had already reached a remarkable level, which was constantly improved during 30 years of successful work, making Kicks & Sticks an acknowledged player in the world of jazz. Nowadays, Kicks & Sticks is considered to be one of Europe’s best youth jazz orchestras. It has been the stepping-stone to a musical career for more than 1800 young musicians. The worldwide successful tours in East Africa, Hungary, Australia, Romania, South-East Asia, South America, Poland, Canada, Russia, Japan, Lithuania, Vietnam, South Korea, Cyprus, Greece and the Middle East are important milestones in the band’s history. The absolute highlights were the concerts at the Sydney Domain Park Jazz Festival and at the Montsalvat Festival in Melbourne, which electrified Nat Adderly so much that he played a spontaneous solo with the band. CD productions also represent highlights of the band’s work, and this even with distinction: with their first CD “Kicks and Sticks” the orchestra won the German Record Critics’ Award. Today, Kicks & Sticks is an important part of the German cultural landscape and has proved its value as a figurehead to the German state of Hessen. Kicks & Sticks has been sponsored since 1990 by the Hessen Ministry for Science and Art.